The Fall/18 Walk Your Walk shoe campaign celebrates being true to yourself. 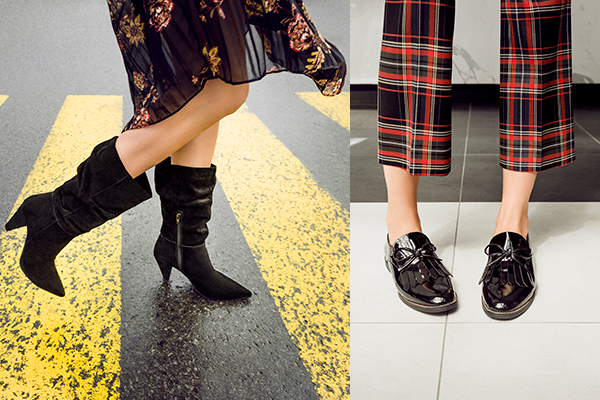 Start a journey, take the step, and #WalkYourWalk in our fall footwear. Take our quiz to find out what your shoe mood is. 1. DESCRIBE YOUR IDEAL VACATION. a) Give me a beach and a mojito! For those morning-to-evening lounging days, throw on an effortlessly chic dress, such as this chiffon one shoulder option, for dinnertime-glam. Whether you’re driving a few hours away or going cross-country, being comfortable while in a car is key. Go for a jersey knit top and some cool joggers for a relaxed and no-fuss ‘fit. c) Life’s motto: the crazier, the better! From whitewater rafting to climbing Mt. Everest, there’s not much you wouldn’t try. Be a risk-taker with your fashion too in this leopard printed ruffle blouse. Walk, eat, and twirl your way through the cities in a dress that is almost as beautiful as the views. This ruffled dress is chic, elegant, and will perfectly go from sightseeing to pasta-eating. 2. WHAT IS YOUR STYLE MOTTO FOR A NIGHT OUT? a)	Here for a pop of colour! Whether as your full look in this red-hot number or with a standout piece, like this crossbody bag, bright colour is your wardrobe’s best friend. Because wearing neutrals does not mean boring fashion… pair this black tunic dress with, the new neutral of the season, a leopard print crossbody. c)	The bolder, the better! Unafraid of taking risks, make a fashion statement in this lips print dress paired with a red clutch. This powder blue dress is as sweet as you are and will carry you through any event. Finish the look with this blush, jewel embellished minaudière. 3. WHAT IS YOUR FAVOURITE FALL ACTIVITY? Hay rides, cider tasting, a day out with friends… finish off the day by getting that perfect apple picking Insta-photo in this red moto jacket. Do you love the delectable smells of cinnamon, nutmeg, pumpkin, and apple? This belted wrap coat is the perfect companion for an ingredients trip to the farmer’s market. It’s almost that time of the year for all the spooky Halloween festivities. Take on all the tricks and treats in this studded waterfall jacket. Fall is the prettiest times of the year, and there’s nothing like strolling through the crimson foliage. Keep warm in the cooling weather in this stylish bouclé coat. 4. IT’S HAPPY HOUR! WHAT’S YOUR POISON? This tailored double breasted blazer will ensure your boardroom-to-bar ensembles are always fresh, playful, and chic. This glen check blazer will perfectly fit with someone who is all for the classics, any time of day. A bit of easygoing flair is added with a waist-cinching belt. Go straight from the office to 5à7 in this check print blazer. Wear it with the matching crop pant or mix it up over a shift dress. Paired with trousers or relaxed jeans, this pearl embellished bouclé blazer will take your wardrobe from work to weekend, with a touch of femininity. IF YOU GOT MOSTLY A’S… YOU ARE REBELLIOUS AND PLAYFUL. 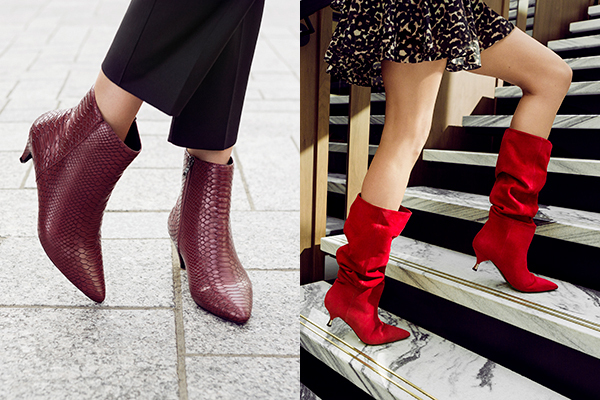 Go against the grain with a pair of standout boots. These snake embossed ankle boots will be there to spice up any night. For a cheekier option, these Italian-made suede knee-high boots are calling your name. IF YOU GOT MOSTLY B’S… YOU ARE CAREFREE AND SPIRITED. Your happy-go-lucky demeanor needs a pair of easygoing shoes that match. This patent round toe loafer will always be there to effortlessly take you wherever the wind blows. Likewise, these suede knee-high slouch boots are bold, feisty, and ready to take on the world with you in strides. IF YOU GOT MOSTLY C’S… YOU ARE FEARLESS AND ADVENTUROUS. Step out in a pair of shoes that are as daring as you are. Say hello to your new favourite boots for all your thrill-seeking adventures: these leopard print ruffle ankle boots and these patent lace-up combat boots. IF YOU GOT MOSTLY D’S… YOU ARE CONFIDENT AND MINDFUL. As a here-I-am-world kinda girl, you’re all about being present and authentically you. The party don’t start till you and these studded Chelsea boots walk in. 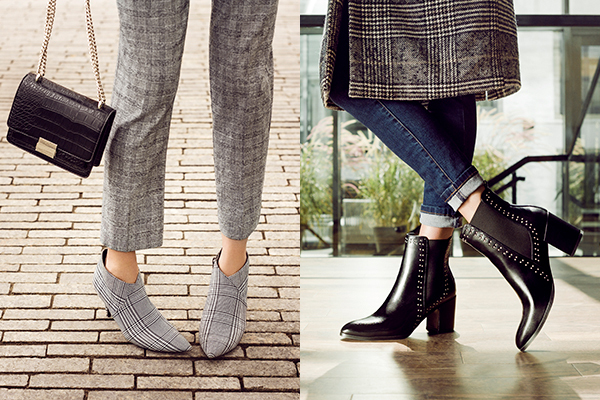 Alternatively, these check print ankle boots are ready to make a statement.